Night vision scopes represent a huge advancement within rifle scope technology for a number of reasons. On a basic level, night vision scopes allow you to see your target when there is minimal light. This makes you more dynamic as a hunter, as you don’t have to be controlled by the daily cycles of the planet when stalking your prey. Instead, you can transcend the sun. This means being able to hunt not only when it’s completely dark but also when there simply isn’t enough light, like at sunrise and sunset. Many animals that humans typically hunt are nocturnal animals, so this amazing technology extends our sensory capacities and turns us into relentless predators. Yet, within the night vision technology, there have been many developments over the years. In particular, there are different kinds of night vision scopes as well as different generations within each kind of night vision scope. 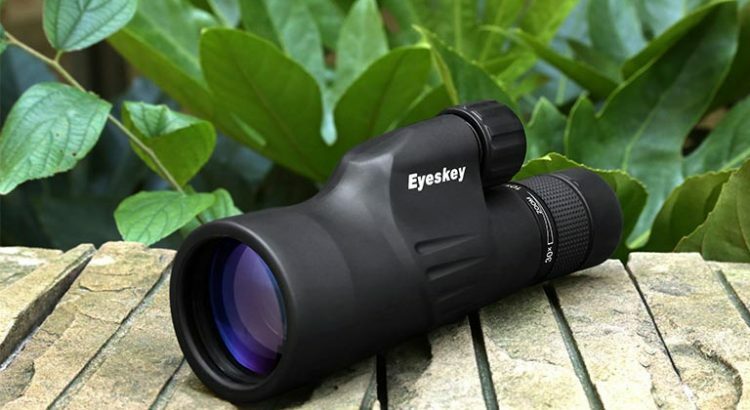 While most night vision scopes are used for hunting, they can also be used for any activity that is performed without sufficient light, like camping, security enforcement, and fishing. In this article, we will be mainly focusing on night visions scopes that utilize light amplification technology, specifically when applied to hunting. In particular, we discuss generation (gen) 2 night vision scopes as compared to generation 1 and 3. We first give a brief overview of each generation, highlighting the pros and cons of each. Then we offer a review of some of the most popular gen 2 night vision scopes, ending with our final thoughts on the future of the night vision industry. When it comes to night vision technology, there are two main methods that products use to provide us with an image of our environment. First, there is thermal imaging, which essentially measures the heat emitted by things in our environment. A specific sensor within the scope is able to interpret this heat by determining the differences in heat within our environment. Then, an image called a thermogram is provided on a screen within the scope. What’s unique about this method is that no light is required to reproduce an image. On the other hand, light amplification technology requires light in order to provide us with an image of our environment. It does this using an image intensifier tube which records photons on a plate, magnifies them, and then recreates an image from these light particles. Depending on how advanced the light amplification technology is, there can be multiple plates that these photons interact with, and each plate provides additional enhancements that result in a more precise image. While not much light is needed with light amplification technology, there still needs to be some light. Many hunters will carry with them an infrared light source that they use to provide this light. Most of the time, the image that is reproduced is shown using some combination of black, white, and green coloring, as these are the most effective colors for displaying contrast within a dark environment. Night vision scopes that use light amplification technology have a rich history of usage dating back to World War II. In this section, we will give a brief overview of the 3 main generations of night scopes. Gen 1 night vision scopes were introduced during the Vietnam war and were an improvement on the first night vision scopes invented during World War II. 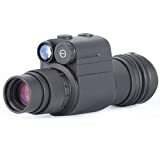 In particular, while the initial models of night vision scopes required infrared light, the gen 1 night vision scopes could utilize ambient light and were able to produce a light amplification of 1000x, which was a significant development. While Gen 1 night vision scopes are still around today, they are still based on this old technology which makes them inferior to later generation models. Mainly, they require moonlight or an infrared illuminator to operate successfully and are extremely heavy when compared with the lightweight guns available on the market. This is important since most night vision scopes are usually attached to guns when hunting, and if they aren’t, they still must be carried by the hunter. Gen 1 night vision scopes are also very cheap, so they appeal to many hunters on a strict budget. Gen 2 night vision scopes are much more efficient then gen 1 night vision scopes mainly due to the presence of a second plate for interpreting photons. This results in cleaner, brighter images with a higher resolution. Gen 2 night vision scopes also require less ambient light then their earlier generation counterparts and are effective anywhere from 100-200 yards. This is significant, as gen 1 night vision scopes are only effective at distances of 75-100 yards. Furthermore, gen 2 night vision scopes are able to minimize the amount of blooming that occurs, which represents a notable drawback of earlier generations of night vision scopes. In particular, blooming refers to the temporary blindness or “whiteout” that can occur when a bright light is introduced while using night vision scopes. This light can overload the intensifier tube and can distract the hunter even though the night scope is able to eventually correct the compromise. Gen 2 night vision scopes are able to reduce the impact of blooming as well as correct for this phenomenon more quickly. This is because some of the most expensive gen 2 night vision scopes are equipped with auto-gating technology, which allows the power of the system to turn itself on and off rapidly. In addition to this auto-gating technology, many gen 2 night vision scopes feature longer battery life and greater functionality since they can be attached to a wider range of guns. As such, if you do not have the money to purchase a gen 3 night vision scope, then gen 2 is considered the next best option. Gen 3 night vision scopes were only introduced within the last 20 years and offer superior performance at an expensive price. Gen 3 night vision scopes almost entirely eliminate blooming and provide images of your environment up to 300 yards. In addition, their battery hardly ever needs to be replaced, lasting up to 10000 hours. They are considered so effective that even the military uses them. Even further, their technology is considered so advanced that they have been banned from being transported outside of the US. The main drawback of gen 3 night vision scopes is their price, which makes them inaccessible to most hunters. Most gen 3 night vision scopes the sky’s the limit for the most expensive ones. The D-300 from Night Optics only weighs a pound. It can be mounted on headgear or a weapon and is considered extremely durable. Many customers have noted that it provides outstanding image quality under a decently lit sky. Additionally, the D-300 is considered weather resistant, which means you don’t have to worry if it starts raining, as this gen 2 night vision scope will still function despite the moisture. This makes the D-300 extremely dynamic as it can operate in a number of environments, thus extending the mobility of the hunter. 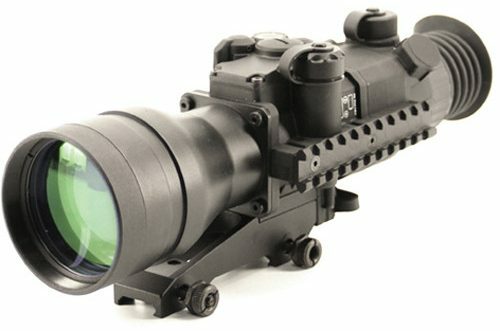 The Avenger from Armasight is unique for offering Automatic Brightness Control. This feature allows the night scope to constantly adjust the brightness of the image you are seeing in order to account for changing environmental conditions. This translates to less work by the hunter when they are focusing, which can lead to better accuracy and precision. Even having to tinker with a setting for several seconds can be costly, especially in low-light conditions when the hunter’s vision is already compromised. This night scope also comes with a hand strap and neck strap to improve mobility as well a tripod mount. Many customers commented that the Avenger is ideal for close-range activities and that its images are greatly compromised when viewing a target greater than 200 yards. While this is the typical limit for most gen 2 night vision scopes, some gen 2 night vision scopes still provide a decent image at distances over 200 yards. Yet, the Avenger is hardly functional over 200 yards. The Night Spirit-2 from ATN is the cheapest gen 2 night vision scope that we will be discussing. What sets it apart is not only its price but its high-quality 50mm lens that is coated for protection. This lens coating helps make the lens fogproof and weatherproof so that it can be used in any environment, making the hunter more versatile. Many night vision scopes are advertised as fogproof yet only resist moisture when certain conditions are met. In particular, many of these inferior scopes will still fog up in certain temperatures. Yet, the Night Spirit-2 can withstand temperatures as low as -40 degrees Fahrenheit, which makes it extremely reliable and durable. Some customers have noted the edges of the image appear slightly distorted on the Night Spirit-2. While this is usually not a problem, as the center of the frame is most frequently utilized on night vision scopes, it’s still a factor to consider before purchasing. Most gen 2 night vision scopes are considered law-enforcement grade, which means they are relied upon by police officers frequently for performing their duties. The Night-Spirit 2 lives up to this distinction, as many former police officers have commented that this gen 2 night vision scope is just as good as the scope they used when they were actively on duty. In particular, most customers exalt its clear images and top-quality optics. 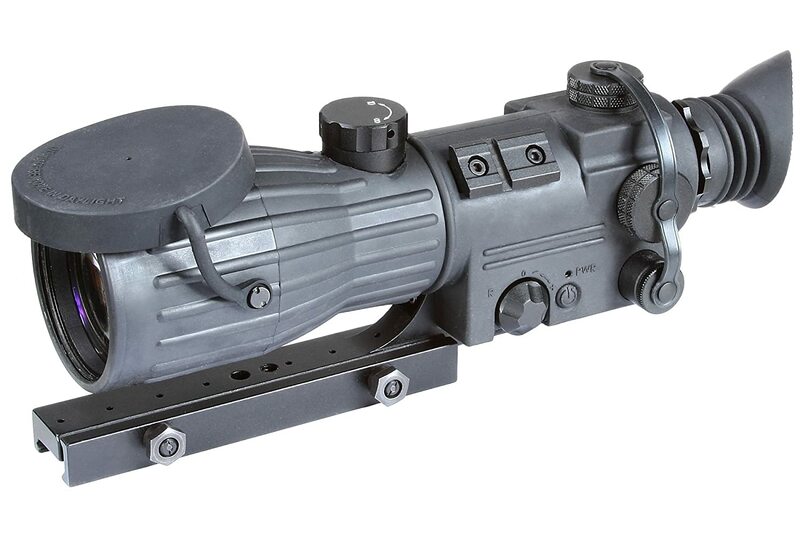 The Nemesis from Armasight is the most expensive gen 2 night vision scope on this list. While this scope does come with some extra features, like the ability to adjust reticle brightness, many customers have noted that it’s too expensive and that a similar quality scope can be purchased for a fraction of the price. In addition, some reviewers have commented that the scope does not mount well and comes loose over an extended period of time. This has forced some hunters to pay for a custom mounting of the scope, which only makes the Nemesis cost even more. Additionally, some customers have noted that while the clarity of the image is amazing, this quality decreases as magnification is increased. Thus, the Nemesis is best for short-range distances. We think the market for night vision scopes has undergone much evolution over the years and that this trend will only continue in the future. This is especially due to the prevalence of violence in our society, as many countries are funding innovation when it comes to military technology. This is not necessarily a good thing, per se, as it’s an indication of a world on the brink of war. Yet, it does mean that customers who use night vision scopes for more sustainable activities like hunting can benefit from these advancements. We think that the gen 2 night vision scopes in particular represent an affordable option for hunters looking for a durable, high-quality night vision scope. When gen 2 night vision scopes were first released, they were very sensitive to blooming. Yet, many modern gen 2 night vision scopes have mitigated this imperfection through auto-gating technology, thus making them practically flawless when it comes to blooming. The only drawback to purchasing gen 2 night vision scopes is that gen 3 night vision scopes exist, and these are more effective at longer ranges and have a longer battery life. If none of those factors matter, then we recommend that you purchase a mid-priced gen 2 night vision scope like the Night Spirit-2 from ATTN or the Avenger from Armasight.